PT Wijaya Karya Beton Tbk - WIKA Beton (IDX : WTON) is a well established public listed precast concrete company in Indonesia, headquartered in Bekasi West Java. 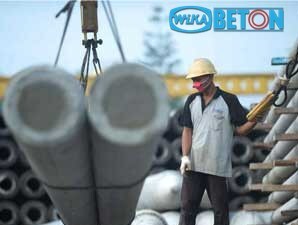 WIKA Beton is a directly-owned subsidiary company of state-owned construction giant PT Wijaya Karya (Persero) Tbk (WIKA Group). As of December 2016, WIKA Group holds 60% shares in WIKA Beton. Another 40% are owned by Koperasi Karya Mitra Satya (7.46%), Treasury Stock (4.33%),WIKA Foundation (0.99%) and public shareholders (27.22%). WIKA Beton was first established in 1977 and initially started as a division unit of WIKA Group. Since 1997, WIKA Beton has officially operated as a separate business entity from WIKA Group. WIKA Beton runs its business through 14 concrete plants, 6 marketing offices and 3 representative offices spread across Indonesia. WIKA Beton also supported by 3 subsidiaries; PT Wijaya Karya Komponen Beton, PT Wijaya Karya Krakatau Beton and PT Citra Lautan Teduh. In the business year of 2016, WIKA Beton succeeded in posting excellent financial performance. According to PT Wijaya Karya Beton Tbk Annual Report 2016 as cited by JobsCDC.com, WIKA Beton registered total assets of Rp 4,662.32 billion in 2016 or up 4.63%% from Rp 4,456.09 billion in 2015. Total revenue in 2016 amounted to Rp 3,481.73 billion. This number is equivalent with an 31.26% increase from Rp 2,652.62 billion in 2015. Referring to its annual report, WIKA Beton registered a 63.91% growth in total net income after tax of Rp 281.56 billion as compared with Rp 171.78 billion in 2015. Civil Engineering (Structural, Geotechnical, Project Management and Transportation). A minimum final GPA of 3.00 / 4.00. Maximum age of 27 years old (Fresh Graduate / Experienced). Willing to be relocated in all Business Unit of WIKA Beton. Fluent spoken and written English and have a minimum TOEFL score of 500 from trusted language institutions (please attach your TOEFL Certificate). JobsCDC.com now available on android device. Download now on Google Play here. Please be aware of recruitment fraud. The entire stage of this selection process is free of charge. PT Wijaya Karya Beton Tbk - New Employee Program WIKA Group February 2018 will never ask for fees or upfront payments for any purposes during the recruitment process such as transportation and accommodation.